Product Condition: The Onyx Shoe - Men's is in Excellent condition. These shoes were previously for three weeks. The following observations were made regarding these item. *They were used for an occasion. *There aren't any defects in them at all. *They got minor dirty, cleanable. *All items sold as is, all warranties void. Comprised of timed downhill stages across hyper-technical terrain, yet still requiring riders to pedal or hike between timed stages, enduro racing is its own distinctive beast, especially compared to its downhill and cross-country brethren. 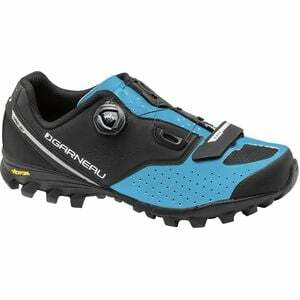 Catering to these distinctive needs, the Men's Onyx Shoe represents Louis Garneau's foray into the world of enduro racing and all-mountain riding. Immediately noticeable, the Onyx's rugged Vibram sole efficiently transfers rider energy into forward momentum, all while allowing riders to tread across hike-a-bike sections with sure-footed confidence. The hybrid lacing system combines a traditional forefoot strap with Boa's IP1-S dial, which provides two-way micro-adjustments along the upper. LG employs their HRS-90 heel retention with a non-slip membrane, preventing heel slip from sapping power output. This heightened level of adjustment and non-slip fit is crucial for competitive enduro racers and all-mountain riders seeking the best of support and pedaling power. It's crafted from a synthetic leather upper for durability when you're thrashing them throughout the racing and riding season. Inside the shoe, LG's Power Zone ensures optimal arch support, so you can pedal hard without cramping or painful hot spots. It's a bit roomier than race-specific shoes in Louis Garneau's line, meaning you'll experience greater comfort than what you'd find with a cross-country shoe. This is essential for multi-hour affairs where you'll be doing a mix of riding and hiking, especially across steep, mountainous terrain.